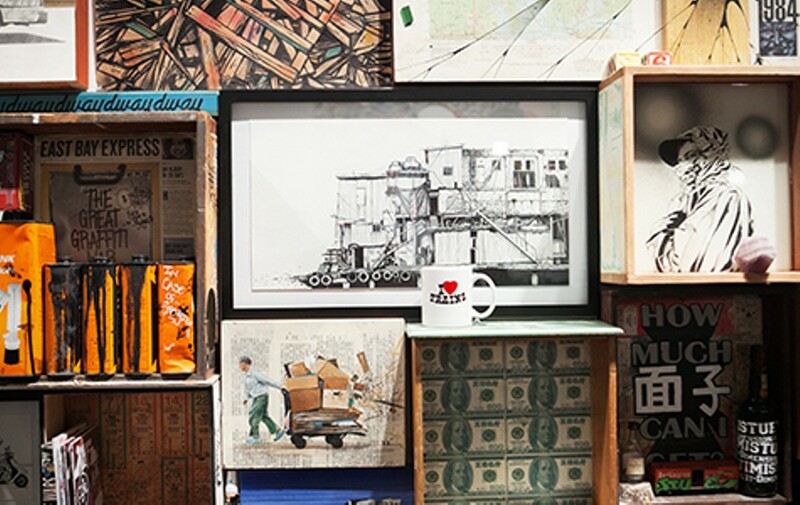 Optimist's sprawling installation at LeQuiVive Gallery offers a poetic self-portrait made from objects for his solo show Packrat's Paradise. When the artist known as Optimist was a kid, the best part of Halloween was organizing all of his candies into neat categories that fit together in a grid. To this day, he can't help but create compositions out of all of his stuff. He collects objects — maps, toys, sketches, photos — that help him hold on to time as it passes by. Packrat's Paradise, his current show at LeQuiVive Gallery (1525 Webster St., Oakland) showcases that obsession. The main attraction is a massive installation of paintings surrounded by collected objects, fitting perfectly together in an off-kilter grid. Optimist never shows his face in photos, but the installation is a better portrait than any picture could offer. All of the objects came from his house. They were installed in the same style in his living room. After transporting them all to the gallery, Optimist intuitively rearranged the objects and added more paintings — with imagery including a pile of broken pallets, people riding motorbikes, and a hooded figure mid-tag. 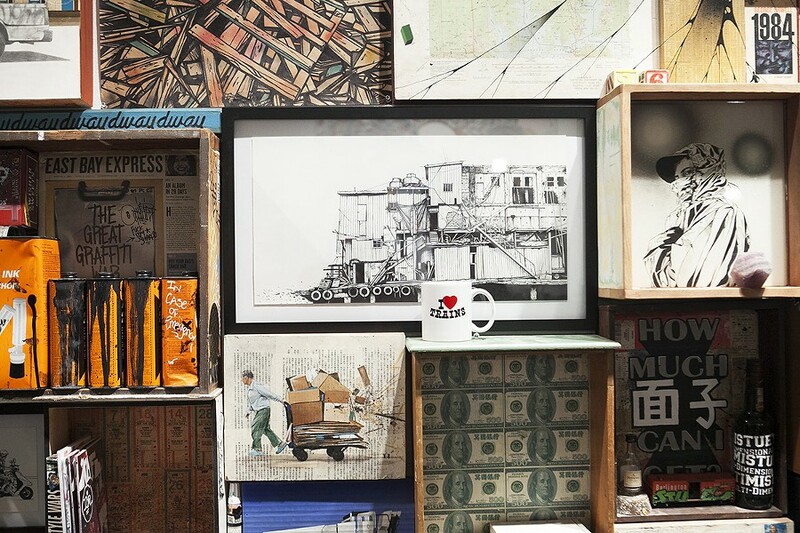 The combination of trinkets showcases the intersection of two aesthetics that aren't often paired: that of life as a graffiti writer, and that of life in an Asian metropolis — particularly Taipei. Optimist lived in Taipei for three years, from early 2007 until late 2009, and his work is obviously influenced by the look of the city. In a place like Taipei, you often see objects stacked atop one another haphazardly, but with a satisfying sense of spontaneous organization. You see people balancing towers of eggs, crates, or sacks on one motorbike. "Organized clutter," Optimist called it in an interview. He believes we're slowly losing that human aesthetic to sleekness. And his installation feels like a truer expression of life than a singular painting placed on a white wall. "You have to live a lot of life to make art, for me" he said. It's clear that Optimist has lived a lot of life so far. He's been writing graffiti since he was sixteen, and he has a mass of stories and a revered reputation to show for it. Packrat's Paradise is about all the souvenirs he's collected along the way. Each object in the installation holds sentimental value, or represents an experience he's had. "Everything is placed next to something that tells more of a story as to why it's there, so it's like a puzzle," he said. Inside one of those boxes there's a photo of him with a happy-face sticker over his head, next to a photo of his mom and stepdad with the numbers 1-4-3 covering their faces. That's pager code for "I love you." In another spot, a real ponytail cast in resin sits on top of a combination of two maps. The hair belonged to the friend who convinced Optimist to move to Taipei, and who almost died in a bar fight and had to shave his head for brain surgery one night when the two were together. The next time he cut his hair was years later when he joined Optimist back in San Francisco. The ponytail traces a path from his address in Taiwan to his address in the Bay Area. But those are just two small details of the sprawling installation — packed with literal layered materials and metaphorical layers of meaning. Optimist studied Conceptual Information Art at SF State, but instead of pursuing that, he stuck with graffiti. He began doing figurative painting after he had settled in Taipei, because he was inspired to capture everything that he saw around him. Since then, he's tried to keep his graffiti and fine art lives separate, but they are constantly battling each other for his attention, and thus inevitably mix. Along with the installation, the show includes a massive painting that also originated in Optimist's living room. He stretched the huge piece of canvas across a wall in his house to sketch out ideas and to practice painting. When his friends would come over, they would tag on the canvas, their work creeping closer and closer to the figurative paintings. Optimist would then buff their tags, and it would happen all over again. For the show, he decided to turn the idea board into a finished painting. The end result is a twisting tornado of destruction, with planes crashing into buildings, a sinking barge, endangered animals in agony, and just ahead of it all, a tiny old man hauling a cart filled with cardboard. He's the only human amid the chaos, and it's as if he's tugging all the world's issues after him, as he makes a hopeless attempt to save it by recycling. Beneath the impressive figurative rendering and symbolic imagery, on the edges of the painting, a clutter of tags clearly shines through the thin layers of paint on top of them. It's a welcome addition to the mess that confirms it's a piece by Optimist. And, he admitted, it's yet another metaphor for his life.